The controversial Export-Import Bank of the United States, whose business lending has been slowed by board vacancies and divisions in Congress, over the weekend lost its acting chairman and president. Obama administration holdover Charles Hall, in an interview with The Wall Street Journal as he prepared to exit, warned that congressional inaction on confirming board members could become a burden to taxpayers because a lending freeze has dried up the revenue the agency usually collects in fees. “If we don’t get a board, probably sometime in 2018 I would anticipate that we would cease to be self-sustaining,” said Hall, a former CEO of an Africa development corporation. Hall pointed to a backlog of $37.5 billion in planned transactions that are stalled by the absence of an Ex-Im Bank board quorum. Some $20 billion of that could be pushed through within six months of the Senate confirming President Trump’s nominees for the bank’s board, he estimated. Four vacancies remain on the seven-member board (two are ex-officio). The agency’s highest-ranking leaders left are acting Vice Chairman and First Vice President Scott Schloegel, Senior Vice President and Chief of Staff Jesse Law, and Executive Vice President and Chief Operating Officer Jeffrey Goettman. A new financial officer was just named, career employee Inci Tonguch-Murray, the bank's press office said late Monday. Michael Ding is acting deputy chief of staff. A Senate Banking, Housing and Urban Affairs Committee spokeswoman told Government Executive that no date has been set for a committee confirmation vote. 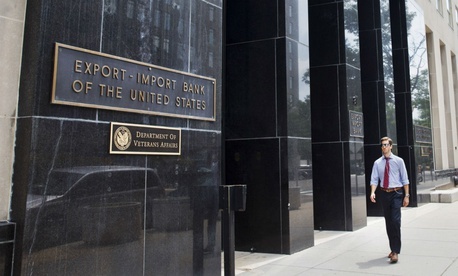 Criticized by both the right and left as an instrument of “corporate welfare,” the Ex-Im bank was threatened with elimination in recent years. But it won a surprise reprieve from President Trump, who in April nominated former Rep. Scott Garrett, R-N.J., to be the new chairman. In October, Trump nominated four board members: Spencer Bachus III (whom he had already nominated in June), Claudia Slacik and Judith Delzoppo Pryor, plus Kimberly Reed to be a board member and first vice president. In September Trump also named Mark Greenblatt to be the bank’s inspector general. The controversy comes because Garrett was on record as having favored killing the bank, which he once said “embodies the corruption of the free enterprise system." But at a Nov. 1 confirmation hearing at the Senate panel, he addressed the issue obliquely by saying, "My role has changed. I am not in a legislative function. I do commit sincerely to carry out the letter of the law as established by Congress." Panel Chairman Mike Crapo, R-Idaho, called Garrett “a longtime public servant who will bring transparency and efficiency to the bank’s operations. Congressman Garrett has committed to pursue regular Ex-Im board meetings to transparently and thoroughly review the bank’s transactions. He has also committed that under his leadership, the bank will remain fully functional, operating in a fair manner to support American jobs and provide maximum value to the U.S. taxpayer,” Crapo added. But ranking member Sen. Sherrod Brown, D-Ohio, said, “Opponents of the bank like Mr. Garrett have ignored basic facts, manufactured false allegations, and disregarded common sense to justify their position. Confirming Mr. Garrett as President of Ex-Im would be like putting an arsonist in charge of the fire department.” Brown also pointed to opposition to Garrett from the U.S. Chamber of Commerce and the National Association of Manufacturers. This story has been updated with input from the Export-Import Bank press office.